Hello everyone! Did you know that the First Episcopal District is planning to expand our membership in the local churches in a major way! There are plans in each Annual Conference and Presiding Elder’s District in place to make sure that each local church grows its members. The YPD should be involved in this process as we are always looking for new ways to recruit young people to participate in our ministry. Let’s get excited and involved in growing our church. 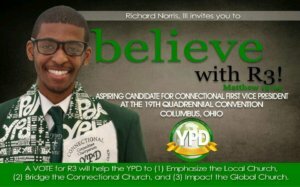 Also, our Brother Richard Norris III better know as R3 is planning a run for Office in 2019 and needs our support. Please see his announcement and get prepared to support him in his run to become one of the great leaders of our church.